Big bass love lily pads. So do bigmouth sharpies. Photo by Tom Schlichter. It must have been a small down-draft that caused it to miss. Or, perhaps the small mayfly simply miscalculated. In either case, it was now precariously perched, half on, half off, a small lily pad at the edge of an open pocket. I watched it for a second or two, wondering if it would manage to pull itself to safety up on the green leaf. It seemed unhurried, almost as if resting with no desire to climb aboard. Perhaps it had no idea that a small bluegill was also watching, or maybe it simply didn’t want to draw any attention to itself by struggling. Either way, it should have made the effort, for its fate was pretty much sealed. Slowly, the bluegill rose to the surface, kissed the edge of the pad and, with a gentle smacking sound, added a tiny dose of protein to its diet. Unfortunately for the bluegill, as it turned for the bottom it ran face-first into the maws of a charging largemouth bass. In one huge boil, the bluegill, too, vanished from sight. “This is too perfect to pass up,” I mused to myself. Before the swirls had even dulled I flipped a 3-inch, floating Rapala to the corner of the lilies only a couple of feet away. Too close to even make a retrieve, I gave the lure a twitch and then watched it disappear in another ferocious whirlpool that locked me at little more than rod’s length from a very riled 3-pound bass. For the next few seconds I held my breath as the fish, with a mechanical leverage advantage against my drag due to its close proximity, turned the kayak around, exploded across the surface and churned toward the deepest reaches of the pads. Fortunately, the drag did give a little as I lowered the rod to decrease its bend and the fish, although wrapped in salad and lily stems, held to my sharpened trebles. Man, it’s great to be at the top of the food chain. 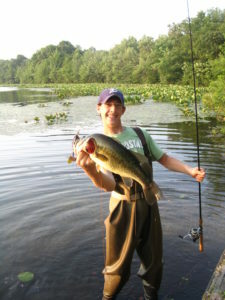 It may look impenetrable, but back cove waters filled with lily pads have the potential to produce monster bass. Photo by Tom Schlichter. Big weedless frogs are one lure that’s sure to create bigmouth havoc in a quiet section of lily pads. This hawg couldn’t resist a Spro Bronze Eye frog. Photo by Tom Schlichter. I have always found it amazing just how much life you can observe when poking quietly around a dense set of lily pads. Damsel flies, dragon flies, mayflies and a host of other water-loving insects abound on the sweaty green leaves, lighting here and there for a drink, a rest or to lay their eggs. Clumsy bumble bees and hard-working honey bees visit the pretty white and yellow flowers for a sip of sweet nectar. Frogs work back and forth between the pads, especially close to shore, picking up a spot of dinner here, meeting up with other frogs there. Further off the bank, small turtles poke their heads up between the leaves, blending in carefully with the many lily buds. Occasionally, a large snapping turtle will push through the pads, or a muskrat will slip quietly by along the edge as it heads for its den. Beneath the surface lies a labyrinth of tunnels and passageways, corridors to a meal for some fish, escape routes for others – maybe both, depending on the circumstance. 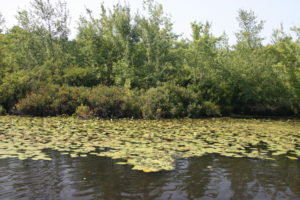 As minnows and young-of-the-year panfish and bass come to the lilies to feed, larger predators hold back in the shade of the leaves or in the tunnels, blending in with the stems. Here they wait for the smaller fish to be distracted by the necessary task of feeding. In the fish’s world, ambush is a honorable trade. Smart bass fishermen rarely pass up the chance to work a lily pad patch, for they know these leafy communities are living bass magnets. 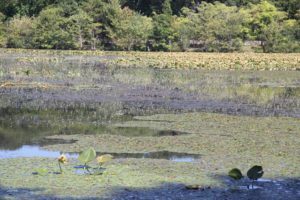 In fact, in shallow lakes and ponds lily pad patches may be the biggest bass attractors of all. They offer structure, shade, protective cover, feeding opportunities, edges to follow and points that lead the way to deeper water. In short, they offer a plethora of reasons why bass would hold close by. Work the lilies hard and with purpose and you can’t help but score. I like to think of lily pads as being similar to shoreline edges for they closely parallel many bank fishing setups. Look carefully and you’ll spy small coves, points, drop-offs and flats areas within each lily community. These are the same type of areas you might probe when working along a shoreline and the logic follows suite. Work these changes as if they were topography breaks. As in shallow water bank fishing, it’s important to approach the lilies as quietly as possible. For the most part, lily communities grow in water depths of six feet or less. Thus, any bass or large predators lurking here are already on alert. Bang a paddle against the side of your kayak, tip over your tackle box or allow a flopping fish to bounce around the bottom of an aluminum johnboat and the bass will either retreat to the densest areas of the pads or move off to deeper water. Thus, rule number one for working lily pads is to keep quiet. Look for rough edges to hold hungry bass and pickerel. A lush point like this one offers predator species plenty of ambush possibilities. Photo by Tom Schlichter. Assuming you’ve gotten to the pads with no major blunders, the next step is to size up the edges. Jagged edges with small pockets are more productive than straight, unbroken edges. Small coves, cuts, indents and points in the lily edges are the places where you should concentrate. Especially productive are end points that serve as double edges, one side sliding toward shallow water, the other out toward greater depths. Remember, large bass are using the pads for ambush points, the more broken the edge the more opportunity for bass and big pickerel to blend in unnoticed. It’s these broken edges that you’ll want to work over again and again. Fishing from a kayak or boat, it is usually best to approach the lilies from an upwind position. This will allow you to drift along a selected edge or set of pads silently, with minimal aid from paddles or electric motors. If the wind is blowing hard from an inopportune direction or, if a particular section of the pads looks especially enticing, consider quietly anchoring. In either case, make it a point to keep a fair cast away from the pads on this initial pass. Later, you can dig a little deeper. Think of your first pass along any lily pad edge as a cursory probe. Rather than dig right in to the meaty sections, try skirting the edges with a twitch bait, jerkbait, floating/diving plug, buzzbait or spinnerbait. Make your initial casts a bit out from the edge, say five or eight feet toward open water. These first casts are meant to draw the fish out from the pads so you can perhaps hook-up without disturbing prime holding areas. This is your chance to work any long edges or large pockets. Try to cast so that your lure will parallel as much of the pads as possible. Make two or three casts to each general target, casting tighter and tighter to the edge each time. Having made an initial pass, your next step is to probe a bit deeper into the leaves. Whereas the cursory casts along the edges afforded use of a variety of lures, your next series of casts should be made with the traditional tools of slop fishing. For this pass, you’ll want to work a weedless frog, weedless worm or soft plastic creature bait, or a jig & pig of some sort. Move in closer to the pads now and keep your casts short and sweet. Cast past small pockets and then gently work your lure out of the leaves and into the open, then try to keep the lure in the open area for as long as possible before working it back into the leaves. This is flippin’ territory, so get up close and probe even the tiniest crevices thoroughly. The background says “Big bass live here.” Photo courtesy of Austin Rutcofsky. Be aware as you work the lilies that each set of pads plays host to several edges. 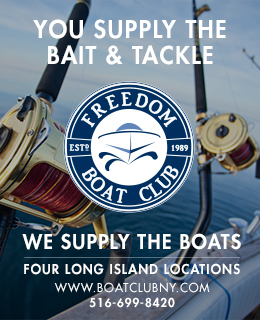 Depending on weather conditions, water temperature, bottom contour, etc., the fish may on any day favor the inshore (shallow) edge, side edge, or offshore (deeper) edge. Also, watch for patterns as you score. On cloudy days, for example you’ll find that bass generally favor lily points. Bright days tend to push the fish back into the deeper coves, cuts and tunnel entrances. 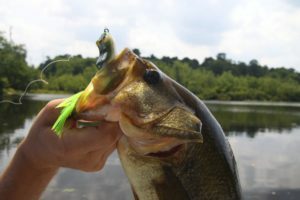 In windy weather, the bass are more prone to stray from the edge and sometimes take to cruising long straight stretches several yards off the pads. Keep in mind that each set of lilies has its own personality. The bass on some sets will be more aggressive than on others. Some points, crevices and lily coves seem to be more productive than others that may appear nearly identical. Thus, it helps to pay close attention to which areas produce and under what conditions. Often, you can pull fish from the exact same spots trip after trip when you match specific conditions to specific locations. If the lily pad sets are large, work one thoroughly before moving onto the next. If the sets are small, consider working two or three as if it were a single community. Work the perimeter of each set first, then come back and dig deeper. This should help keep the bass from feeling too pressured and moving off. Lastly, keep a tight drag when working the pads, and choose a beefy setup that can handle lines in the 10- to 17-pound class. 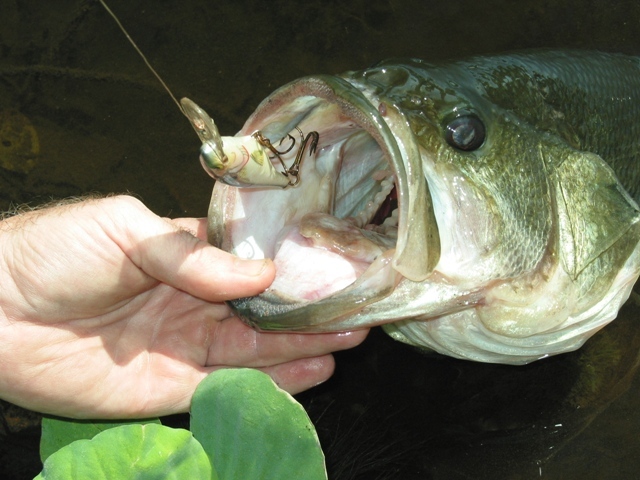 Big bass seem to instinctively know how to dive into the densest sections of each lily bed. Light lines virtually guarantee break-­offs when lunkers strike, and a drag set too lightly will allow the fish to wrap around a lot of stems, gain leverage and pull the hook. No matter how you cut it, lily pad bassin’ will result in some of the most heartbreaking lost fish you’ll ever encounter. It can also pay off handsomely with hawg bass that will smash your lures, tail-walk across the water and hang tough until you untangle them from the lily stems. These are fish that will keep you smiling and leave a tale to tell long after you’ve put them back. And isn’t that what it’s all about?